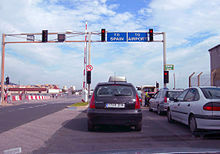 ^ Joint Civil Use of the Airport. [2004-08-15]. （原始内容存档于2005-12-12）. ^ Córdoba Tripartite Agreement. [2006-11-22]. （原始内容存档于2006-10-20）. ^ Government of Gibraltar. New Air Terminal, tunnel under the runway and new road leading to all parts of Gibraltar north of the runway - New Road/Tunnel. [17 January 2016]. （原始内容存档于2007年11月24日）. and images of the proposals: New Air Terminal, tunnel under the runway and new road leading to all parts of Gibraltar north of the runway - The New Air Terminal. [17 January 2016]. （原始内容存档于2007年11月24日）. 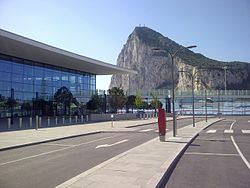 ^ New Gibraltar Airport Terminal Plans revealed. [2007-10-28]. （原始内容存档于2009-03-14）. ^ 8.0 8.1 8.2 Government of Gibraltar. Press Release: New Air Terminal, tunnel under the runway and new road leading to all parts of Gibraltar north of the runway (PDF). [2008-10-17]. （原始内容 (PDF)存档于2010-02-24）. and images of the proposals: Press Release: New Terminal Building (PDF). [2008-10-17]. （原始内容 (PDF)存档于2008-10-29）. ^ 'Terminal is Just the Beginning' - The Gibraltar Magazine. [2007-10-28]. （原始内容存档于2008-05-01）.